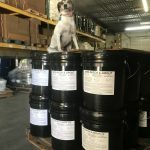 This is the first post from Jessie the Office Dog! Meet Jessie, our office dog. Jessie had a rough start in life but she’s now living large. She was rescued after Hurricane Katrina by owner John Caramanian and she’s still afraid of storms. What breed is she? John says, “She’s a mystery.” But there’s no mystery about the fact that she loves coming to the office with her dad and going for a walk in the park near the office at lunchtime. 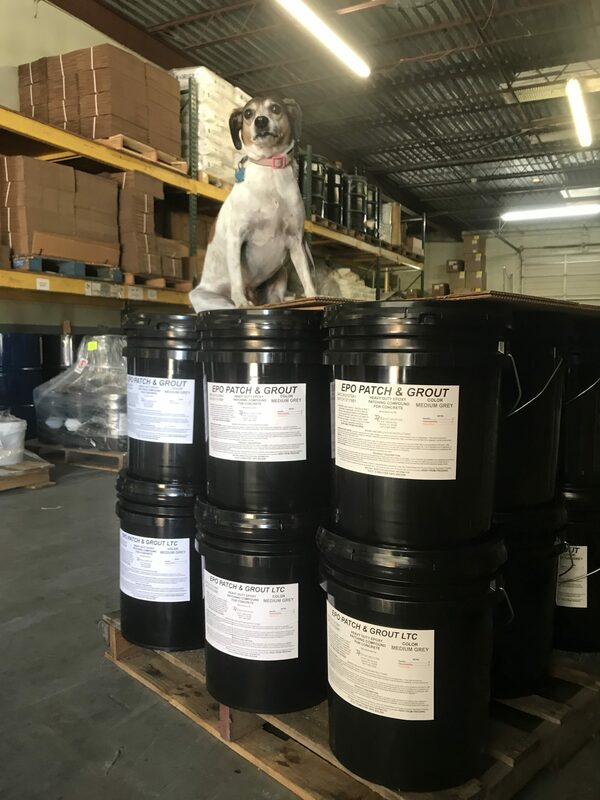 Jessie inspects a shipment of EPO-Patch Grout before it goes out the door. Jessie has claws of steel and has been known to leave holes in her backyard. And she loves digging holes in the sand at the beach. But even she can’t dig through EPO-Patch & Grout–our toughest concrete repair product. EPO-Patch and Grout is great for any kind of concrete repair, from your home driveway to your business floor. It works indoors and outdoors and stands up to the toughest weather Mother Nature can dish out. It’s been used to patch everything: marinas, breweries, processing plants, truck stops, parking garages and driveways. Jessie is standing by for your order: BUY NOW!